By the time this posts it will have been a few weeks, but as for when I write it, it has only been a day. My wife and I went to a Family Christian Store that is closing and has everything marked 40-80% off (which is technically true, since all their Christmas stuff is 80% off, but everything else is 40%). We found a few books and such, but there was this painting/print that I saw that I couldn’t help but like. I’m not a guy who sees a painting and feels drawn to it, but I literally went back to look at it multiple times while browsing the store. There was something I enjoyed about this painting. I had to show Katie, but only after looking at it a half-dozen times or so myself. She bought it for me! After all it was 40% off (not 80% though, because it wasn’t Christmasy). 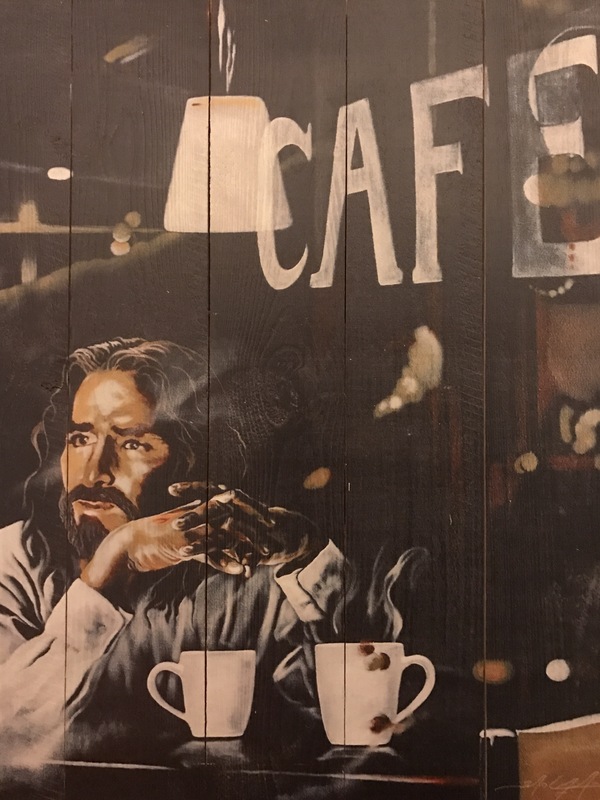 The painting is one of a modern-day Jesus (with a white button-up shirt) sitting at the window in a modern-day coffee-house. It is painted from the vantage point of outside looking in. There are two cups of coffee on the table, but only Jesus is sitting. No one else is around. Jesus is just sitting, looking out the window, fingers crossed, as if he’s letting his mind wander (like anyone who is staring out a window). The picture is inviting. It is as if Jesus is waiting for someone to come join him. He has an appointment with someone or the person stepped away for a moment or perhaps he is simply looking for somebody–anybody–to ask to join him. There’s no anxiety on his face, no discouragement. He’s just enjoying his coffee and patiently waiting for someone to strike up a conversation with him. That’s what we do when we want to catch up with someone isn’t it. “Let’s have a cup of coffee and catch up.” When we see an old friend, “Got time for a cup of coffee?” It’s great to be reminded that at any moment I can ask Jesus if he’s got some time for a cup of coffee. He’s already there simply waiting. At the end of time, history will culminate in a great banquet (Rev 19:9), but as we have seen, we can eat with Jesus now. How? Through prayer. Commentators understand that Jesus’ invitation to “hear his voice” and “open the door” so he can “come in and eat with that person, and they with me” (Rev 3:20) is an invitation to fellowship and communion with him through prayer. (Tim Keller, Prayer, New York, Penguin Books, 2014, p. 140). Seeing Jesus sitting at a coffee shop is about as big an invitation to fellowship and communion as our modern society knows. In fact, I’m ready to have some coffee now. I might just have two cups this morning; I have a feeling the conversation is going to be a good one. By the way, as always I’d love to hear from you. Below is a picture of the print. I told you what I got from it; what do you get out of it? Send me a comment.